There's been an influx of SSH clients coming out for the iPhone, but the one many have been waiting for has just arrived. Zingersoft's iSSH [$4.99, App Store] client was released to the App Store last night. - Arrow keys (by swiping in left 2/3rd of screen). - Ctrl, tab, shift, and Fn keys, all in combination. Due to the influx of SSH apps, the developer reports he temporarily cut some features to deliver this build earlier. I created a build I considered stable, not feature-packed. That means no X Server or multiple connections. Neither are quite ready yet. Just the same, what Apple had submitted to them has exactly what you have seen in the screenshots. Landscape and portrait, a keyboard that's removable in landscape mode; scrollback via swiping; arrow keys via swipping; crtl, Fn, tab and shift (and combinations there-in) as well as a command on connection. 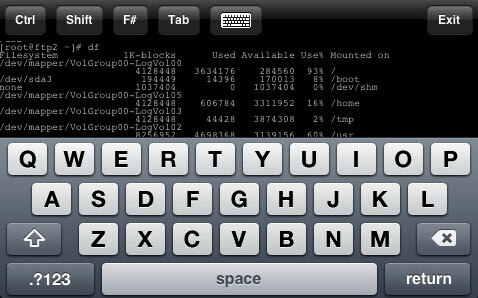 - Additional keys in landscape mode, specifically "ESC" and "|"
Unlike the other SSH clients, iSSH is also available internationally. iSSH is available in the App Store.